Your Dreams Coming True In The Kitchen: Pommes Dauphinoises.....Creamed Baked Potatoe Second Edition. Pommes Dauphinoises.....Creamed Baked Potatoe Second Edition. This is a second way to make this dish which I shared with you on July 8th 2011. In my opinion it is much better. - 1.2 kg of potatoes, sliced medium ¼ inch thick. - ½ tsp. freshly ground nutmeg. - 4 cloves of garlic roughly chopped. - Peel, wash from dirt, the potatoes. - Slice potatoes ¼ inch without any further washing (they must keep their starch). - In a saucepan add the garlic and the butter and stir fry till the beautiful aroma of garlic is obtained. - Add milk, cream and nutmeg. - Bring to a boil and add potato slices. - Simmer for ½ hour. The potatoes will spill their starch to the milk/cream mixture and you will end up with a creamy thickish fluid and the potatoes will be al dente. - Brush some butter on the bottom and sides of a casserole and throw the potatoes in and bake for at least ½ an hour to finish the cooking and obtain the color you like. 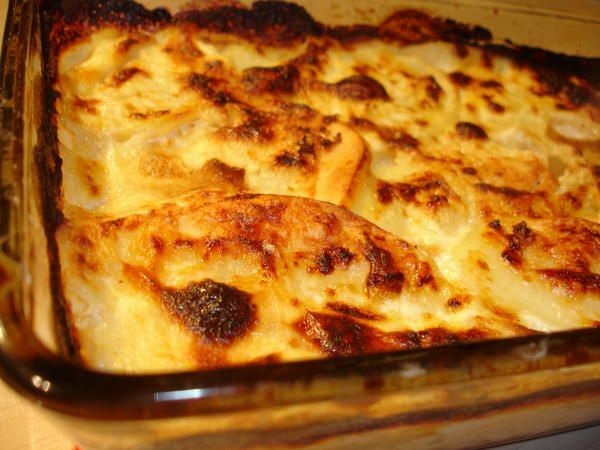 - Bring out the casserole from the oven and let cool at least half an hour before serving, the dish must be just warm.